Raffle Tickets for Comic-Con 2013 Passes! One of our more unique fundraisers was the sale of raffle tickets by our Torrey Pines (La Jolla) Rotary Foundation, with the winning ticket receiving two passes to the Comic-Con 2013 convention Preview Night and two passes to the 4-day convention. For those not familiar with Comic-Con it is a convention in San Diego that draws 130,000+ attendees each year, and typically sells out within 45 minutes. We were most grateful for the opportunity to obtain two tickets for our fundraising efforts. Entrants from around the world participated in our raffle, and the winner was a young man from Florida. Thank you to those who supported this Torrey Pines (La Jolla) Rotary Foundation fundraiser. Funds raised were used to continue and expand our many local and international service projects, including funding arts and education needs. A partial list of current projects is below. I am off (what an understatement) with Ed Ott for our fourth and last bike ride across America. To complete the four sides of our beautiful country, we will ride about 1900 miles from Calais, Maine on the Canadian border to Miami, Florida on the Cuban border. What extremes! 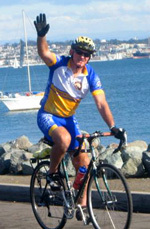 As in 2010, my Rotary Club of 43 years, Torrey Pines, will lend their support and good cheer. My goal is to raise $19,000 ($10.00/mile) for our Rotary Club Foundation that supports local and international worthwhile causes. All donations will go to the Rotary Club Foundation. Ed and I pay all of our own expenses. Below is a partial list of the beneficiaries from the 2010 ride. If you can help, please pledge a flat amount or an amount per mile (1 cent is $19.00). Please make checks payable to Torrey Pines Rotary Foundation. Mail to: Torrey Pines Rotary Foundation c/o William E Irwin Jr., 2254 Moore Street, Ste. 202B, San Diego CA 92110 or donate online. Check this page daily for the latest news from Bill and Ed. Catch up with the history and itinerary of the 2010 Bike Ride. You can make a contribution online with a Mastercard or Visa. Your contribution will be collected by the Torrey Pines (La Jolla) Rotary Club Foundation. The Torrey Pines (La Jolla) Rotary Club Foundation being a 501(c)(3) organization, your contribution will be tax-deductible in the USA as provided by law. Click here to make an online donation through our secure payment system.